Solution: The graph shows the distribution of molecular velocities for the same molecule at two different temperatures (T1 and T2). Which temperature is greater? Explain. 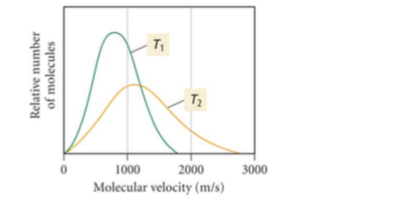 The graph shows the distribution of molecular velocities for the same molecule at two different temperatures (T1 and T2). Which temperature is greater? Explain.